Dorothea Dix was a self-educated woman who had several successful careers, but she is best known for laying the foundation for humane and therapeutic care of the mentally ill. Her efforts still shape the care given in mental institutions today. Dorothea Lynde Dix was born in 1802, the eldest of three children. Growing up in Maine, she felt neglected and was very unhappy. Her father was a book dealer and lay minister who moved the family often. Dorothea resented the moves and the fact that he expected her to help prepare religious tracts that promoted hellfire and God's wrath. Her mother, a very self-absorbed woman, provided little support for the young girl. At the age of 12, Dix ran away to live with her grandmother in Boston and later with an aunt in Massachusetts. Although she received very little formal education, she was always intellectually curious and studied many subjects in-depth, attended lectures and surrounded herself with knowledgeable people. These traits served her well in later years. For many years, Dix struggled with her feelings about religion. She agreed with the moral principles but could find no spiritual satisfaction. Finally, in the 1820s, she found her home with the Unitarians. She responded positively to their teachings of the goodness of God, which was in complete contrast to her earlier experiences. Her correspondence of many years with Anne Heath, a fellow Unitarian, gives an insight into Dix's love of learning as well as her insecurities and loneliness. 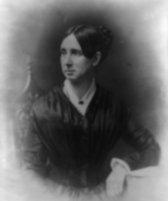 Although Dorothea Dix was successful in bringing about great changes for the mentally ill, at the end of her life she was depressed because more progress had not been made. She died in 1887 at the age of 85 and is buried in Cambridge, Massachusetts. Dix's career as a teacher began when she was 14. In spite of her lack of formal schooling, her self-education and maturity prompted her to open a successful private school in Worcester, Massachusetts, where she lived with her aunt. When she moved to Boston in 1821 to be with her grandmother, she opened a school for young girls there. Her concern for the poor led her to open a free evening school for underprivileged children, one of the first in the United States. During this time she also wrote a number of children's books including Conversations On Common Things: Or Guide to Knowledge , Moral Tales for Young Persons and Meditations for Private Hours. In 1836, ill health most likely caused by long hours and lack of sleep prompted her to take an extended leave from teaching. After some time in England with friends, she returned to the United States but was still not well enough to return to teaching. She supported herself with funds from her grandmother's estate and royalties from her books. It was in 1841 that a seemingly random event occurred that would change Dix's life and the lives of so many others. A ministerial student who was unsuccessful in teaching a Bible class to women in jail asked Dix for advice. She decided to teach the class herself, but once she saw the conditions in the jail, she knew that changes had to be made. Not only was the jail unheated, but criminals, the mentally ill and feeble-minded children were housed in the same space. Never one to shirk what she thought was her duty, she started a campaign for reform. After obtaining a court order for heating the jail, Dix thoroughly researched the subjects of mental illness and treatments of the day. She soon knew as much as anyone in the field. To expand her knowledge further, she visited many jails and homes for the poor throughout Massachusetts. She found conditions worse than she had expected and took meticulous notes to document her findings. When her research was complete, she had a well-known doctor present her findings to the Massachusetts legislature asking for funds for a state mental hospital. This effort was successful and it emboldened Dix to take the reform to other states. For over ten years, Dorothea Dix traveled from state to state, collecting information and asking well-known political figures to present her findings to state legislatures. Many hospitals were built and improvements made to existing ones. Dix's mission was to provide quality mental health nursing while providing a therapeutic atmosphere for the curable insane and comfortable housing for the incurable. Disappointed over refusal of her plan for federal funding for the mentally ill, Dorothea decided to take a trip to Europe to rest. However, once she was there, she saw the inequities between their public and private mental institutions and worked for reform there as well. Returning to the United States in 1856, Dix continued her mental health reform work, but, by then, the slavery issue divided the country. When the Civil War broke out in 1861, Dix felt the call of duty and volunteered to serve. She was appointed to be the Superintendent of United States Army Nurses, a position that earned her the right to be listed as one of the most famous nurses in history. Even though she was not trained as a nurse, her extraordinary intellect, research skills and past experiences prepared her to do the job well. She was in charge of setting up first aid stations, hiring nurses, buying supplies and organizing training facilities and field hospitals. Her biggest obstacles were her lack of social skills and difficulty in working with a bureaucracy. Many of the nurses and doctors thought her autocratic, but she persevered and ensured that the wounded received excellent care and worked on their behalf even after the war ended. Following the war, Dix again took up the cause of the mentally ill, but money was in short supply and she never regained her earlier success. Discouraged, she retired in 1881 at the age of 79 and would not talk about her work. Even though Dorothea Dix became very discouraged about mental health reform near the end of her life, she set the standard for the proper care of the mentally ill. She was the voice of the poor and indigent who could not speak for themselves. Even though not all of her reforms stayed in place after the Civil War, her work still provided a light to show the way. She was ahead of her time by recommending a holistic approach to the care and treatment of the mentally ill rather than custodialism. Many of Dix's unpublished works and letters are at Harvard University. Some of her letters are at the Menninger Foundation and the Kansas Historical Society in Topeka, Kansas.